Molly Pie is 3 years old, or 27 in Dog years. 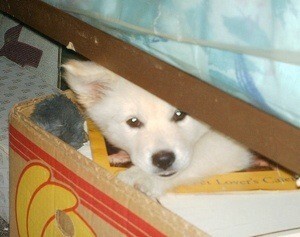 She is an American Eskimo (White Spitz). My husband got her for me. She was just a tiny bundle of white fur and big brown eyes, all of 6 weeks old. It was hot, hot, hot, Texas in July. He found her on Craigslist. He had to drive 60 miles one way, and 60 miles back to get her and bring her home. AND the AC was OUT in the truck. But, he went anyway and got her and she has been such a joy. She is such a character. I am so thankful for her little self. She is happy, ALWAYS happy. She likes to herd the ducks around, and play with Abbydorable, go visit the horses and check out the pygmy goats. And her favorite toy has always been wood, sticks, branches any kind of wood. She will drag a limb in that is 8-10 foot long and gnaw it until it looks like a beaver has been in the house. I let her. I would rather she chew the branches than my antique table and it works. She doesn't chew now. My furniture survived the puppy zone. LOL. Her best friends are Abbydorable, my Chow chow. and Sally Bear, my Keeshond, the grandmotherly type of doggie. I would look up and they would both (her and Abby) would have part of the same 8 foot branch in their mouths, DRAGGING, tugging, pulling, falling over each other while getting it to the house. I Knew Abbydorable wasn't gonna chew it, but she loves to help Molly carry them in.. Go figure..
She is the heart of my heart. I spoiled her rotten and had to back up with her. She decided my room was HER room. No other critters allowed. Well I have three dogs and two cats, not counting the farm critters.. And we could NOT have that. I investigated and talked to an animal specialist in training and she said kick her out of the room. I was like "WHAT? Kick my baby out? How long? Forever?" No just a couple of minutes. So I did just that the next time she growled at one of the other critters for coming into OUR room. I booted her gently out. I left her there for three minutes. And brought her back in. It only took three times for her to learn that it wasn't HER room. LOL. Now she is sweet and gentle to ALL critters and We are all happy again. Oh, I use those inserts for crock pots for water bowls. And If Molly gets hot she will sit in it (ALL FOUR FEET, all scrunched up and goofy. I asked the vet about that. He said "Oh, she will grow out of that." NOT! She is 3 and to this day, if she gets hot she will climb in that crock. And look out geese or ducks. If they are in the kiddy pools we have for them, both her and Abby will be in them. Abby will rest a paw in the bowl, But Molly just climbs in.This is Molly the first night she was with us, and this is my favorite picture of her. She is just adorable. My dog loves bring in sticks too. Well, we have a wood burning fire place here in CO and logs are alwasy missing and in every room when we have the stacked by the fire place, it is so funny. My dog Charlie is posted on last weeks edition so chec him out, he also is in the photo contest for last week, if you like put a thumbs up. I love that picture, it's beautiful! I had an American Eskimo a while back, we had to put her down due to illness and I miss her so so much! It was nice to see this picture and read your story!